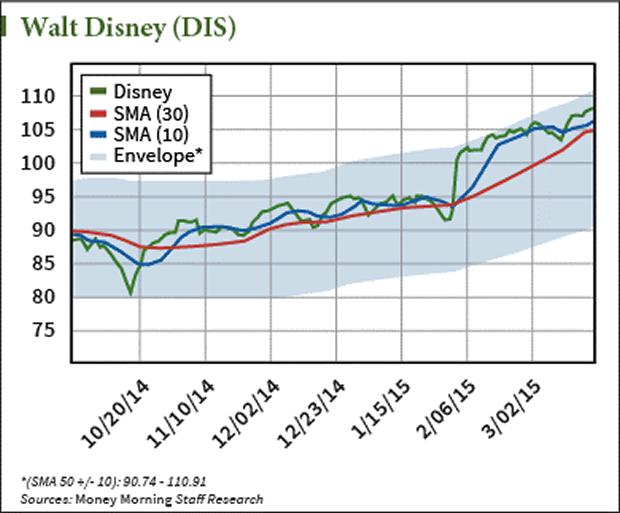 How Investors can Maximize Disney Stock "Magic"
In my estimation, Disney has the potential to hit $150 by year's end, a nearly 30% gain from its price as I write this. Some of that will be dependent on outside circumstances such as interest rates, as well as other economic indicators gauging consumers' discretionary spending. However, if we even approach my estimate then it's possible that continued box office smashes like "Cinderella" and the sleeper of the year "McFarland, USA" as well as its formidable resort, amusements and merchandising revenues, could drive record profits for Disney. The question is, how can we take advantage of the potential for a continued 20% move in Disney stock, but make perhaps 100% + returns with 90% less cost and risk? Here's where options come in. Buying longer-term call options that are close to the money can offer both lower cost and lower risk, as well as higher upside return on investment. A call option grants the buyer the right to purchase a stock at an agreed upon price, for an agreed amount of time. Recently, call options on DIS for January 2016 that are near the current stock price were trading around $7.00 per contract. Since one contract controls 100 shares of stock, the total cost is around $700 per option. This means the options cost roughly 6% of what it would cost to own the stock outright. All with the opportunity to obtain a 100% return. That, my friends, is why I trade options: They're a cheaper way to enter a position coupled with maximized profit potential.